. 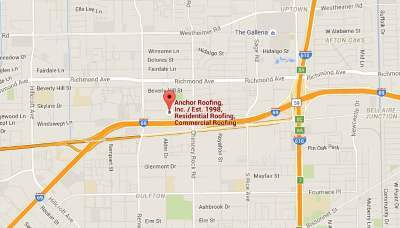 Roofing Safety | Anchor Roofing, Inc.
Roofing Safety, our number one priority! In order to clarify the safety activities of roofing companies in Houston Texas the following is set forth as a basic program to clearly establish its existence. To provide safe and healthful working conditions to the maximum extent possible. Accidents add directly to the Company’s costs. To carry out the Company’s obligations under Federal, State and Local safety and health laws and regulations. To achieve the lowest possible level of injuries. Management considers loss control to be paramount duty of all employees/subcontractors and no other consideration should be any more important than accident prevention. Each member of management has personal responsibility for the safety of all employees. In carrying out this responsibility, a Loss Control Coordinator should be appointed and called upon for assistance. Such assistance in no way reduces the personal responsibility of the employees/subcontractors for safety, nor their obligation to incorporate loss control into the equipment and operating procedures under their control. The establishment of a Loss Control Committee, an Accident Review Committee, and designation of the Company’s Loss Control Coordinator. The development and implementation of written loss control procedures issued over the signature of the President. The provision of safety devices and personal protective equipment whenever their use is warranted. Developing Company guidelines and establishing goals and objectives in accident prevention, fire protection, industrial hygiene and other environmental areas. Participating in trade associations and government agencies and legislation in the field of loss control which affect the Program development. Participating in seminars, schools and new development in the field of loss control to improve the technical knowledge and in return give better direction to the Loss Control Program. Maintaining a technical library of films, training and visual aids, technical articles, reference books, etc. to directly support the loss control efforts. Maintaining records of accidents and injuries and evaluating such records to determine where and how improvements can be implemented. Providing periodic reports relating to the effectiveness of the Program and developing trends. Advising management in the administration of the overall program. Chairing the Loss Control Committee. Chairing the Accident Review Committee. Maintaining liaison with governmental authorities and insurance representatives. Studying and evaluating loss control standards, regulations and applicable laws. Assisting and advising the Insurance Agent of the inherent hazards and exposures in the company for consideration in procuring insurance. Assisting the Vice President Production and Field Supervisors in conducting safety meetings. 3) Support the Company’s Loss Control Program.